These artists do exceptional sea life art glass: Adam Kaser, Michael Hopko of Soul Glass Studio, Robert Eickholt, Chris Lowry & Christopher Richards, Craig Graffius, Kevin O'Grady and David Leppla. In stock are various sizes of jellyfish along with a choice of colors & designs, from sideswimmers to double midnight jelly pink/purple. We also offer sea coral, tide pools, sea anenomes and bright LED's to illuminate your glass sea life sculptures. Our jellyfish pendants by Jeremy Sinkus are extremely popular. Michael Hudson creates tropical fish in a life-like manor. Colors resemble nature's camouflage allowing fish to survive in water. Approx:: 12"l x 7.5"w x 9.5"h.
David Leppla's Angel Fish Vase give's the appearance of fish suspended in water. It looks as if the fish are swimming through the vase, a creation that is truely unique and one that could only be created by a true GlassMaster. It is artist signed DKL Studio and approx. 20"h x 7"w x 6"d."
Davis Leppla Angel Fish Vase in Seagrass. Appears fish are swimming through vase. A unique design and a wonderful conversation piece. It is artist signed DKL Studio and approximately 20" h x 7 "w x 6"d.
David Leppla sculpted sea form vessel, Astroidea Green Crosshatch, based on the starfish. Interwoven yellow cane is exposed by grinding and sandblasting the inner surface away. Approximately 7"h x 8"w x 8"d, & 3 lbs. Signed and dated. 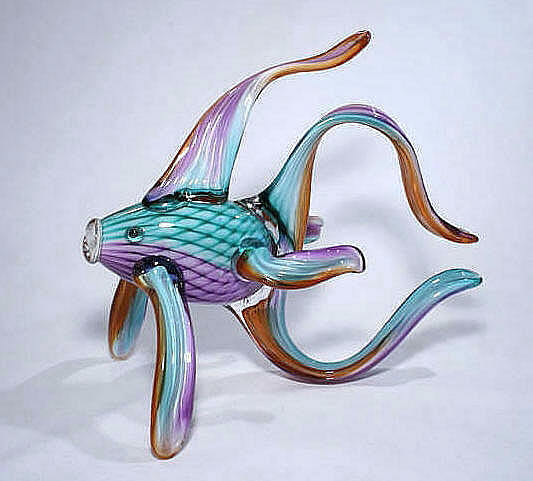 David Leppla sculpted sea form vessel, Astroidea Green V, based on the starfish. Interwoven yellow cane is exposed by grinding and sandblasting the inner surface away. Approximately 8"h x 7"w x 7"d, & 3 lbs. Signed and dated. 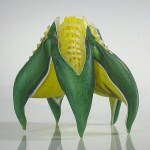 David Leppla sculpted sea form vessel, Astroidea Yellow, based on the starfish. Interwoven yellow cane is exposed by grinding and sandblasting the inner surface away. Approximately 7"h x 10"w x 0"d, & 3 lbs. Signed and dated. Adam Kasers unique sculpture hand blown to perfection with true to life colors and details. Kasers,s passion for fishing plus his glass blowing skills have put him in a class of his own. Pictured is the Large Mouth Bass in medium size 14 - 16"long. GlassMaster Adam Kaser's colorful glass sculpture of Black Crappie. Striking replica of popular salt water game fish. Signed and dated. Shown in small approx 9"long. Available in med, 14" - 16" (size varies with each piece) and lge: 18" - 20.0" l. Signed and dated. GlassMaster Adam Kaser's creation of a Blue Marlin. Glass replica of fighting game fish. Artist signed and dated. Shown in small approx 14.95"l wide. Available in med, 17"- 19" (size varies with each piece) and lge: 20"- 22" l. Looks terrific on a fireplace mantel. GlassMaster David Leppla and his brilliantly colored Sea Scape Vessel with a distinctly aquatic motif of waving colored canes and murrini. Pictured is the blue version with orange and purple available. Size: approx. 14" x 8" x 4". Blue Tang by Glass Artist Adam Kaser. Shown in small, this is a popular tropical salt water aquarium fish. It is artist signed and available in small, 8.0 - 10.0", medium, 12.0 - 14.0", and large, 16.0 - 20.0". Looks terrific on a fireplace mantel. Adam Kaser's, glass sculpture of Blue-Headed Wrasse, a Saltwater Aquarium Fish found in the Caribbean. They can be found in their native habitat in Black, Blue, White, Yellow and grow to seven inches long. Available in small, medium and large sizes. Signed and dated. GlassMaster Adam Kaser's creation of Bluefish. Glass replica of popular salt water game fish. Artist signed and dated. Shown in small approx 9"long. Available in med, 14" - 16", lge 18" - 20"
GlassMaster Adam Kaser's colorful glass sculpture of Bonefish. Striking replica of popular salt water game fish. Signed and dated. Shown in small approx 9"long. Available in med, 14" - 16" (size varies with each piece) and lge: 18" - 20.0" l. Signed and dated. Channel Catfish, fresh water fish, by GlassMaster Adam Kaser. Popular fish of sport fisherman found in lakes & streams. Artist signed, in sm, 8"-10", med 12"-14" & lge 18". GlassMaster Adam Kaser's Small Clown Fish. A magnificant tropical fish with vivid colors indigenous to the species. It comes artist signed and dated and is approximately 7.0" long x 3.75" h x 2.25" wide. Available in medium and large sizes. David Leppla's Clown Fish Vase give's the appearance of fish suspended in water. It looks as if the fish are swimming through the vase, a creation that is truely unique and one that could only be created by a true GlassMaster. It is artist signed DKL Studio and approx. 20"h x 7"w x 6"d."
Davis Leppla Clown Fish Vase in Seagrass. Appears fish are swimming through vase. A unique design and a wonderful conversation piece. It is artist signed DKL Studio and approximately 20" h x 7 "w x 6"d.
GlassMaster Berry Davis and Coral Reef paperweight sculpture. A representation of the coral reefs with interior parts consisting of handmade orbs, murinis, glass spikes, glass threads, 24k gold, silver and various glass powders and frits. Artist signed Davis and approximately 5.25"h x 3.35"w.
GlassMaster Adam Kaser's Cutthroat Trout, a species of freshwater fish in the salmon family . Popular among fly fisherman this fresh water fish has striking colors and fine detail. Shown in small it looks like a real trout. Sm approx 10"l, med 14"l x 7"h, lge 16" - 20" l.
GlassMaster Ron Schuster and his Dichroic Jellyfish Sculpture paperweight. 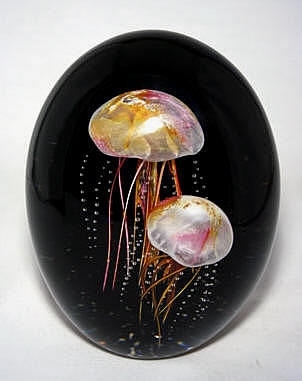 Made in the USA, this magnificent Jellyfish has a dichroic glass dome that sparkles in bright light. Approx. 5.75"h x 3.45"w and 3lbs. Artist signed. Dynasty Gallery Dancing Dolphins Sculpture. Done in colorful rainbow design with dolphins riding a clear glass wave. Always a customer favorite. Great gift. Approximately 7.05" h x 6.10"w x 4.25"d.
Dynasty Gallery Jumping Dolphins Sculpture. Done in colorful rainbow design with dolphins riding a clear glass wave. Always a customer favorite. 7.75" h x 7.5"w x 3.15"d.
GlassMaster Adam Kaser's Dorado in small. An excellent replica in glass of the real fish. Also known as Mahi Mahi or Dolphin fish. Shown in small, a great mantel piece for the real sportsman. Signed Adam Kaser and dated. Approx. 10" l x 5.5" h x 2.5"w.
Adam Kasers unique glass sculpture, hand blown to perfection, has true to life colors and detail. Kasers passion for fishing plus his glass blowing skills have put him in a class of his own. Pictured is the, Mahi Mahi also known as a Dorado fish. Maui GlassMasters Chris Lowry & Christopher Richards double jellyfish. Hand blown & encased in clear glass. Viewing this colorful jellyfish brings a sense of serenity. Done in its natural colors pink/purple, giving it a true life like appearance. Approx. 9.0" h x 4.58" diameter. Maui GlassMasters Chris Lowry & Christopher Richards free floating, double midnight jellyfish sculpture. 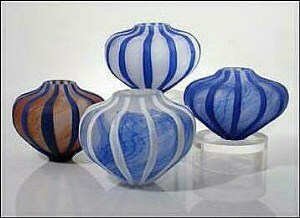 Hand blown exclusively by the artists and encased in clear glass. Approximately 7.75"h x 5.75"w x 4.0"d & 8.50 lbs. Signed Hot Island Glass and dated, Maui. Dynasty Gallery Emperor Penguin and Baby. Striking glass sculpture with high gloss finish. Must have for collectors who appreciate these cute animals. Approximately 11.75" h x 7.5"w x 7"d. and 9 lbs. GlassMaster David Leppla and his Etched Sea Fan Vessels. Glass cane melted into the surface and raised. Available in the soft colors of Blue Red and Orange. Approximately 14"h x 8"w x 4"d.
GlassMaster David Leppla Acid Etched Sea Urchin Vessel in Blue. Brilliant colors with a distinctly aquatic motif of waving colored cane and murrini. Approximately 5"h x 7"dia, artist signed and dated. GlassMaster David Leppla Acid Etched Sea Urchin Vessel in Red. Brilliant colors with a distinctly aquatic motif of waving colored cane and murrini. Approximately 5"h x 7"dia, artist signed and dated. Fish Wall Mount for freshwater fish, with optional seaweed and rock set. You can start with one small fish and build an ensemble. Options menu available when you click on the thumb picture. Pictured is the Cutthroat Trout. Dynasty Gallery Emperor Flying Penguin on Glacier. Striking glass sculpture with high gloss finish. Cute penguin dives off glacier with fins spread wide. 9.5"l x 7.5"w x 7.0"h & 4.5 lbs. Tim Lindemann Lamp-worked Green Glass Frog Sculpture on solid Geode. Colors act as camouflage to protect Frog from predators. Approximately 2"d x 3.0"wide x 3.0"h. Artist signed Lindemann and dated. Dynasty Gallery Frog on Tadpole Globe. Colorful green frog with bulging eyes sitting atop clear glass globe with four tadpoles swimming above underwater seascape. Approximately 4.5" h x 3"diameter.